Content Pages, Administration Depts, Athletics Main page. You are now able to add a Pop Up option in addition to the Top Bar option for your alerts. With the pop up this will show when you go to the home page or the specific page you have selected the alert to show up on. Here you will see the option of Alert Type of Pop Up and Bar to show. Here you will see the Alert example before you publish the alert. You can click on Trigger Alert to see the example. You can now select specific pages to add an alert. 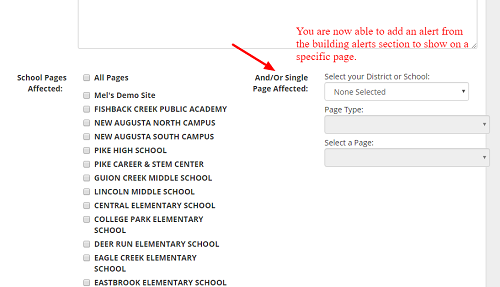 You can add an alert to any page through the Alerts Module by selecting on the District/School name in the Select your District or School, Then you will select on Page Type. If there is a + next to the option you will then click on the Select a Page option and select the specific page.